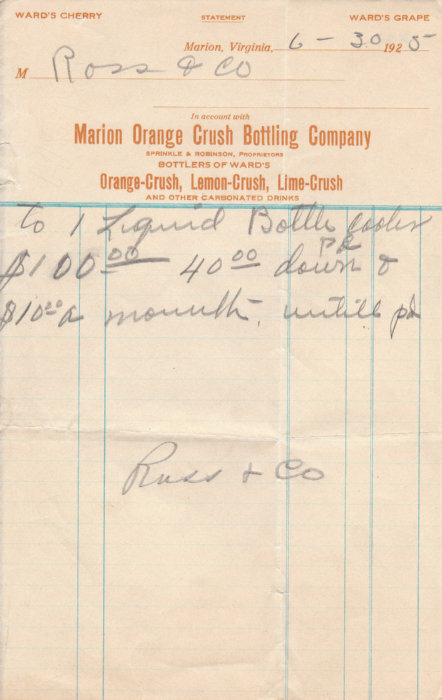 On November 1, 1922 B. Scott Sprinkle and N. Ernest Robinson, World War I veterans, purchased the Marion Bottling Works from the Thornton family. They continued to operate in the old Marion & Rye Valley Railroad depot near the corner of what is today Chatham Hill Road and East Chilhowie Street. They have the franchise to bottle Orange Crush, Lemon Crush, and Lime Crush, which could possibly have been acquired by the Thorntons before they sold the company. 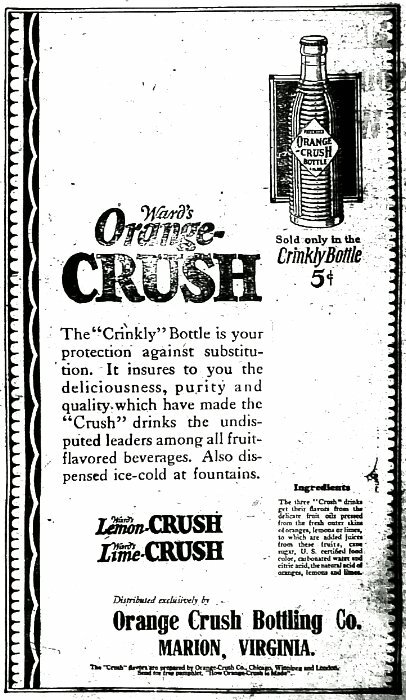 Among the brands that the company was known to bottle were Bob-O-Link, a flavor line produced by Orange Crush, Good Grape, the first brand produced by the company that would become Double Cola, and Pepsi-Cola in 1925. 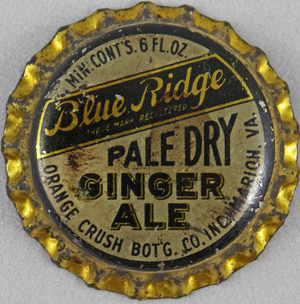 In 1926 they created Blue Ridge Ginger Ale which would be the first local brand created in Marion, VA. 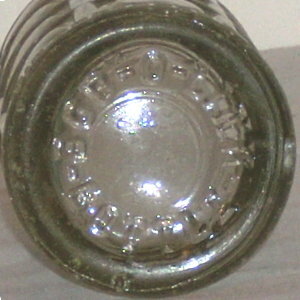 In 1927 they expanded their franchise area by establishing a sister bottling plant in Pulaski, VA, but the partnership between Sprinkle and Robinson was beginning to fracture. (1) This situation had gotten so bad that when Wythe Hull and James R. Shanklin were trying to negotiate to purchase the company they had to meet with each of them separately as they were no longer on speaking terms. (1) Robinson was made Vice President of the new corporation, and B. Scott Sprinkle was made Manager of the sister plant in Pulaski, VA(2), and the company that would become the Marion Bottling Company was born. 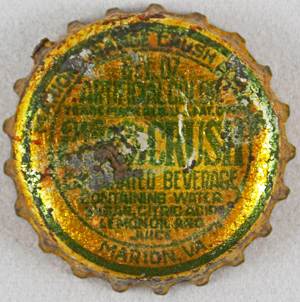 Lemon Crush bottle cap from the Marion Orange Crush Bottling Co.
6oz "krinkle" bottle from the Marion Orange Crush Bottling Co. dated 1924. 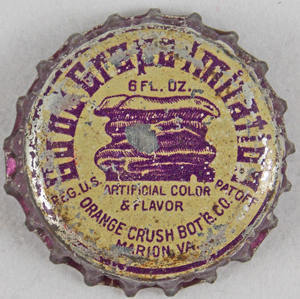 Good Grape and Blue Ridge Ginger Ale bottle caps from the Marion Orange Crush Bottling Co.
6oz Bob-O-Link bottle from the Marion Orange Crush Bottling Co. Bob-O-Link was advertised by the Orange Crush Bottlers magazine in the 1920's, a copy of which was found with some other papers from the company, which would suggest that they knew about this particular brand. 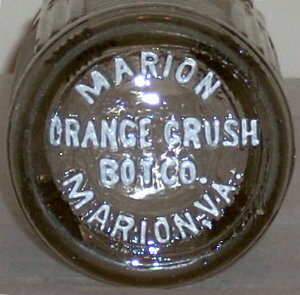 Compound that with the fact that the place where this was found near Marion was covered in these broken bottles suggests that they were indeed bottling this brand, and that they may have went the way of other Orange Crush bottlers and later bottled Good Grape in these bottles.